Home > In Court > How is a Small Claims Trial Conducted? Most people probably have a good idea in their head of what a trial will be like. We have all seen films and television programmes which show us what happens inside a courtroom. However, regardless of how accurate these impressions may – or may not – be, the conduct of small claims trials often bears little relation to the conduct of any other type of trial. The rules on the conduct of small claims trials are found in Part 27 of the Civil Procedure Rules. These specifically state that the judge of a small claims trial can adopt any method for the hearing that he thinks is fair. Part 27 also states that small claims trials “will be informal”. Small claims trials are usually heard by District Judges who will be wearing ordinary smart clothes rather than special robes. The Judge may expect the parties to have discussed the case before the hearing starts to see if any agreement can be reached. If there is any common ground between the parties it will make better use of the court’s time if this can be established at the outset of the trial. The hearing will almost certainly be tape recorded. A District Judge is addressed as Sir or Madam. The conduct of a particular trial will depend on the judge, the court and the case itself. Most judges have their own way of dealing with small claims cases. Some will conduct the hearing like a mini trial, with the parties taking it in turn to give their evidence and make submissions before the judge gives a formal judgment. Others may adopt an approach which feels more like a discussion between the parties and the judge. A judge hearing a small claims trial will often take a more active, inquisitorial role in the proceedings. It is worth bearing in mind that, no matter how informal a hearing feels, it is still a court hearing and deference is owed to the judge. Most small claims trials are not held in a traditional courtroom but in a District Judge’s “chambers”. Chambers are the equivalent of a judge’s office. Many of the hearings dealt with by District Judge’s in the county court are held “in chambers”. This can feel more like going into the headmaster’s office than into the courtrooms one sees on television. 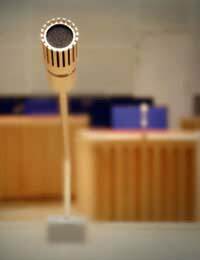 Hearings held in chambers are less formal than those held in a courtroom. The parties will usually sit around a table and do not have to stand when they are speaking or addressing the judge. The general rule for all types of trials is that they should be held in public. It is a fundamental human right that a trial be conducted in the open; that justice is not just done, but that it is seen to be done. Nonetheless, there are a number of reasons why a hearing may be held in private. The conduct of a small claims trial will depend both on the individual judge and on the facilities available at a particular court. Many judge’s chambers are quite small with little, or no, seating available for anyone other than the judge and the parties. In these circumstances a judge may refuse to allow anyone who is not involved in the trial to attend the hearing because to have his room filled with people would interfere with the administration of justice. The term “in chambers” actually has two meanings in legal terms. As well as meaning physically in the judge’s chambers it also means “in private”, therefore a hearing held “in chambers” may be a hearing from which members of the public are excluded. If a judge is said to be sitting “in open court” members of the public are allowed to attend. A party to a small claims trial can ask the judge to decide the case, in his absence, based on their written evidence. If a party wishes to take advantage of this provision they must write to the court at least 7 days before the trial saying that they will not be attending and asking the judge to hear the trial in their absence.